For my full-length review, please visit Casual Debris. As an avid radio listener throughout my teens, I first came across Lorrie Moore by accident when I heard a live reading of her famous short story "How to Become a Writer." 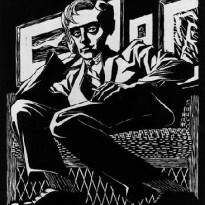 Normally, especially at that age, I would quickly seek out other works of newly-discovered writers I enjoyed, but in the case of Moore, though I continued to stumble upon the story throughout the years, along with one or two others, I never actively searched for more of her work. 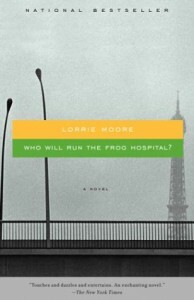 About a year ago I came across a bent copy of Who Will Run the Frog Hospital?, and finally read the book last week. Moore's second novel is a short work that reads like a memoir, a narrator's personal guide through a specific time in her life. (Memoir, however, is simply another kind of fiction, another kind of fabrication; while there are certainly elements from Moore's own life present in the work, it does not read like autobiography.) The narrator is on vacation in Paris in the midst of a seemingly failed marriage, and interspersed with brief conversations with and thoughts of her husband, hearkens back to a summer in the 1970s during which she was obsessed with popular best friend Sils. The work focuses on the relationship, the narrator's insecurities and very much on the decade. Though it is well written (very well written), it is lacking. The plot is incidental and awakens late in the work, which generates an uneven read. (Ironically, this is one of the threads running through Moore's "How to Become a Writer," as protagonist Francie is being criticized for her lack of plot.) The ending is rushed through, acts as an epilogue and is unnecessary. I would have liked to have been left in the uncertainty of the past as mirrored by the uncertainty of the present, as the two narratives should coincide. Or perhaps the present should have also had its own epilogue? But not really. While I did not care much for the work as a novel, it is a fast read and worthy of a read for Ms. Moore's writing skills are impressive. The characters are solid and real, and the small town universe they live in is constructed with great care.